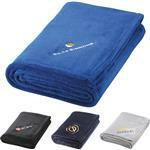 The Micro Mink Custom Blanket - a great holiday corporate gift with your logo personalized. 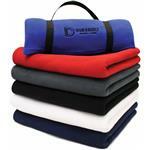 Luxurious ultra-plush fabric on one side and cozy imitation lambswool on the other. Vinyl bag with rope handle included. 50" W x 60" H.
Available Colors: Black, Brown, Grey, Navy Blue, Burgundy, Sand and Olive. Typical Imprint Area(s): Embroidery - Inquire on size as dependent on stitch count. Luxurious ultra-plush fabric on one side and cozy imitation lambswool on the other. Vinyl bag with rope handle included. Polyester.